Nepal Quarterly Report 1st/’17- EXCEPTIONAL !!! GHNI receives both Monthly and Quarterly Reports from each village TCD work and TCD trainers. All S. Asia(India/Nepal/Sri Lanka/Bangladesh), Armenia, and Serbia reports come to me initially, then on to the Geneva and Orlando offices for further editing and publishing on our GHNI WEB SITE. It’s truly a privilege to get an initial look at all that’s going on in these regions! In the month of February 2017, we started our work in eastern part of Nepal. We have targeted 300-350 families to work with about 2000 people living in this village. Most of the people are from poor Rshidev (Musahar) tribe of Dalits community (Oppressed). They don’t have good houses but live in small hut where their cattle live together. Most of them do not have their own land. They don’t have toilet that is why use open field. We discussed about the health issues that has been affected by open toilet. Now they realized that it is very important to have toilet at their house. Therefore we have started toilet construction in partnership with VDC in that village. People in that village both man and women actively participated at the program. In the first phase, they have selected 30 homes to make toilets for TCD program to bring health awareness in that village. They have committed labor themselves for the toilet construction. Also, our staffs have started teaching children, those who don’t go to school and also help women for literacy classes. They have already made committee for toilet construction and micro loan. Suni M. and Sripa R. are helping teaching anti-human trafficking and TCD lessons. 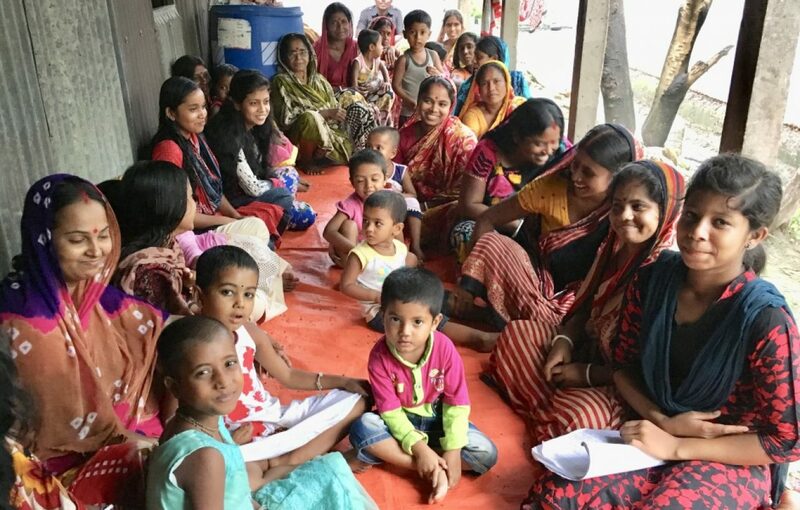 In this month we have continued teaching lessons on anti-human trafficking, awareness introductory lessons to the women groups, literacy classes and teaching children. We taught general lessons on health and hygiene. We taught hand washing to both women and children. VDC couldn’t provide toilet materials to 30 families at a time. Out of them 10 families have started constructing toilets. PERSONAL REPORT – Tell us how you are doing personally. Su and Sri both of us are healthy and good. What are the obstacles, challenges, or opportunities facing this program? Please provide details and discuss possible solutions. Working in a poor community is always challenging. People have a great expectation from GHNI. TCD lessons, awareness and seed projects will help them understand the reality. In the upcoming quarter, we have a plan for building relationship with community people linking with women groups and start self-sustainable groups. Raise awareness about anti-human trafficking in the village. Good to hear about toilet progress (coming from someone who’s fallen through an African “squatty potty”). Sitting down is true “elegance”! 😉 Mary Kindness: Martin Luther King Quote Everybody can be great… because anybody can serve. You don’t have to have a college degree to serve. You don’t have to make your subject and verb agree to serve. You only need a heart full of grace. A soul generated by love.